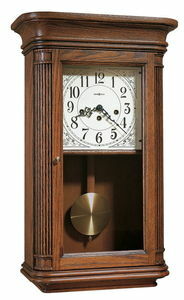 These chiming key-wound wall clocks are finished in Oak Yorkshire on select hardwoods and veneers. 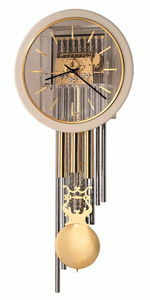 Designed after a traditional Jeweler's Regulator wall clock. Dentil molding wraps around the pediment and diagonally cut overlays appear at the upper corners. The off-white Roman numeral dial offers a solid brass bezel. 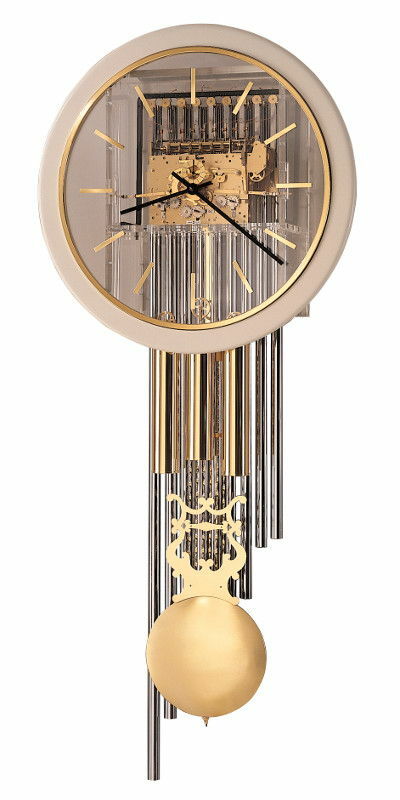 The front-opening locking glass door showcases the polished brass-finished lyre pendulum and beat plate, which completes the look on these wonderful wall clocks. An industry exclusive dual-ratchet winding arbor ensures safe movement winding. Chime silence option and durable bronze bushings Locking door for added security. Finished in Windsor Cherry on select hardwoods and veneers. 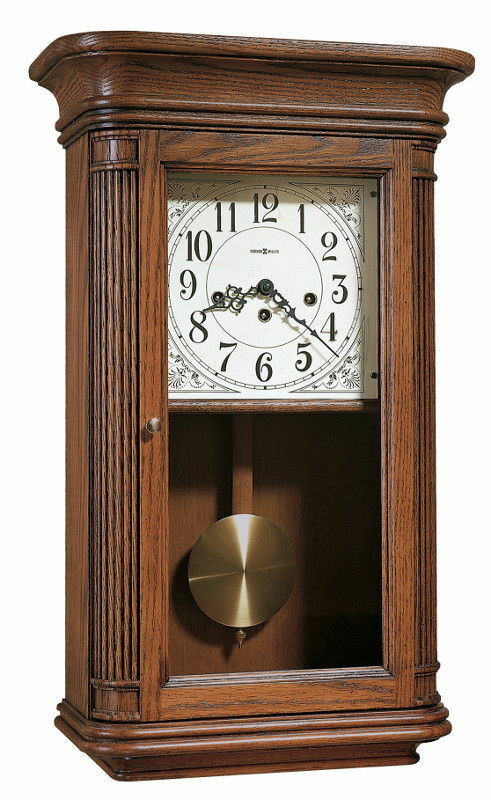 These chiming key-wound wall clocks feature a distinctive dentil molding on the profiled pediment with maple and ebony hand-rubbed marquetry overlays at each corner. The white dial offers black Roman numerals and serpentine hour and minute hands. A polished brass-finished lyre pendulum appears behind the locking door. New Haven finish on select hardwoods and veneers is lightly distressed for an aged appearance. Accenting the pediment and base on these classy wall clocks are four carved overlays and a dentil molding above the dial. The unique dial features a soft, aged design with an antiqued, brushed brass-finished bezel. Fluted columns frame the beveled glass front-opening door with an antiqued, brushed brass-finished pendulum highlighted inside. Finished in Windsor Cherry on select hardwoods and veneers. An impressive pediment features a sculptured cove and enlarged dentil molding. An off-white Roman numeral dial features a solid brass bezel and decorative accents between the numerals. 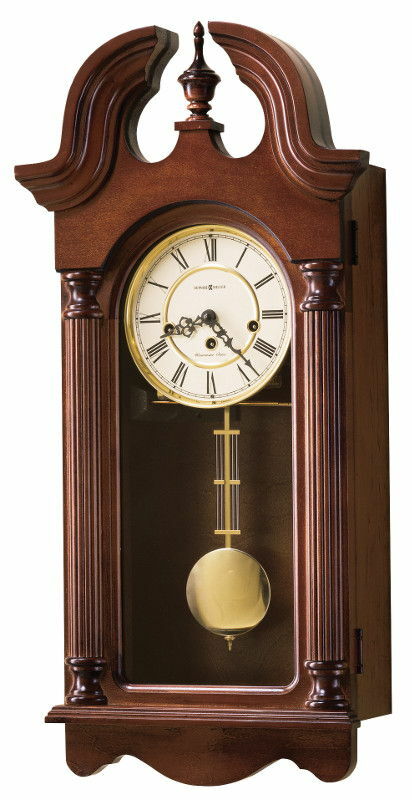 A polished and raised brass-finished pendulum with grid, and polished chime rods add a distinctive touch to the interior of these key-wound wall clocks. The highly polished Viennese dial is overlaid with individual convex chapter rings and center disc with an enameled finish. The front-opening door offers beveled glass. A polished brass-finished lyre pendulum swings by a beat plate. Such accents complete the look of these classy wall clocks. An industry exclusive dual-ratchet winding arbor ensures safe movement winding. Chime silence option and durable bronze bushings. The flat top pediment is accented with olive ash burl corner overlays. A sculpted bottom on the hinged door completes the appealing design of these traditional chiming wall clocks. An off-white dial features black Arabic numerals, black serpentine hour and minute hands. A polished brass finished pendulum and bezel provide the perfect accents to the warm wood case. Finished in Windsor Cherry on select hardwoods and veneers. Features a handsome swan neck pediment with an applied shell overlay. The off-white Roman numeral dial offers a polished brass-finished bezel. Framed behind the front-opening glass door is a polished brass pendulum. An industry exclusive dual-ratchet winding arbor ensures safe movement winding with these wall clocks. Chime silence option and durable bronze bushings. Finished in Windsor Cherry on select hardwoods and veneers. Features a swan neck pediment and turned finial. Ivory dial features polished brass-finished bezel, Roman numerals and decorative hands. Polished brass-finished pendulum features a decorative grid. 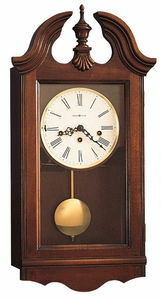 These chiming wall clocks include a key-wound, Westminster chime German Kieninger movement that plays 1/4, 1/2, and 3/4 chimes accordingly with full chime and strike on the hour. Ivory dial features polished brass-finished bezel, Arabic numerals and decorative hands. Polished brass-finished pendulum features a decorative grid. The flared, molded bonnet and fully molded base completes the style on these traditional wall clocks. The off-white dial features Arabic numerals and floral-patterned corner accents. Strikes the half-hour & counts the hours. Hand-rubbed satin luster Espresso finish on cherry hardwoods and veneers. 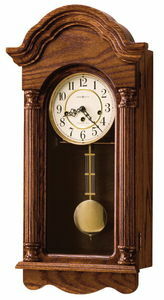 These modern flat top chiming wall clocks feature simple but elegant lines. The gloss white dial features raised black hour markers with a black minute track and hands surrounded by a polished chrome finished bezel. The polished chrome-finished grid pendulum and weight shells adds to the linear appeal of the clock. Beveled glass is featured on the door and on the sides. Removable upper side glass panels are beveled and offer easy access to the movement. Cable-driven, Bim-Bam chime German Kieninger movement counts the hours and strikes on the half hour and includes a strike silence option. Finished in Windsor Cherry on select hardwoods and veneers. 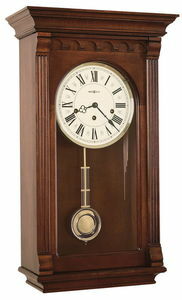 These reproduction chiming wall clocks feature a barometer, thermometer, hygrometer, and a seconds track. The dials are off-white with black numerals and hands. The barometer dial features a red hand. Lower front-opening door allows easy access to the lower dial. Polished brass-finished pendulum appears behind the oval glass in the door. These magnificent 65" wall clocks feature a visible movement made from highly polished solid brass. German Kieninger cable-driven, triple-melody, nine-tubular chime movement features 36 bushings (24 bronze and 12 jeweled). 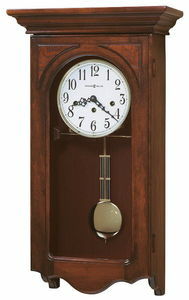 Hampton Cherry finish on select hardwoods and veneers is heavily distressed with light and deep dents for an aged appearance on these wall clocks. These chiming key-wound wall clocks offer exquisite details from top to bottom. Carved acanthus leaf molding wraps around the pediment, while olive ash burl overlays frame the dial. Introducing the most elaborate Limited Edition wall clocks ever introduced. Only two thousand will be crafted and inscribed. These chiming key-wound wall clocks are over 3-1/2 feet tall, and feature a profiled pediment with decorative molding on the front and sides. Rare olive ash burl overlays frame the beveled glass on the door along with two reeded columns with elaborately carved column caps. Beveled glass continues on the sides. Finished in hand-rubbed Windsor Cherry on select hardwoods and veneers. The inscribed dial offers a pierced cast center and applied numerals. Polished brass-finished lyre pendulum with a cast center swings above the detailed beat plate. Polished brass weight shells also complement the case. Decorative rope-styled molding appears on the front and sides of the base. An industry exclusive dual-ratchet winding arbor ensures safe movement winding. Automatic nighttime chime shut-off option and durable bronze bushings.